Make your kitchen the heart of your home with Dream Doors Gloucester. Speak to our designers and view our stunning collection at your local kitchen showroom which services Gloucester, Cheltenham and the surrounding areas. Speak to our kitchen design team at your local Dream Doors Gloucester kitchen showroom to plan and create a stunning bespoke kitchen for your home. Based in Stonehouse, you can find kitchen ideas to suit every taste and speak with our local experts who can help you customise your ideal design. Our Gloucester showroom, owned by Simon, serves the local GL postcode area including Cheltenham, and he will be happy to discuss your requirements and help you create your perfect kitchen. Simon can show you the wide variety of options available to you including our classic, traditional, modern and contemporary designs. As well as our online kitchen design tool, you can also schedule a consultation with Simon, who can come to view your existing kitchen space and provide a no obligation quote based on your ideas. This is a practical solution should you need some first-hand expertise and ensures our design team can get to grips with your project quickly and efficiently. 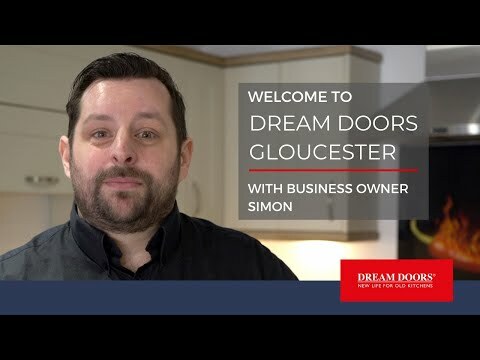 Dream Doors Gloucester offers replacement kitchen doors and fitted kitchens to local GL areas. This includes Cheltenham, Tewkesbury, Stroud, Stow-on-the-Wold, Badminton, Cirencester, Lechlade, Stonehouse, Coleford, Cinderford, Lydney, Forest of Dean, Winchcombe, Bishops Cleeve, Northleach, Tetbury, Chalford, Bussage, Minchinhampton, Nailsworth, Painswick, Upton St Leonards, Dursley, Charfield, Wotton-under-Edge, Eastington, Frampton on Severn and Monmouth. If you’re unsure whether we can cater for your area, just give us a quick call and we'll be happy to assist. "Excellent service and quality product. Workman helpful and friendly, definitely a company to use." "Excellent quality of work - both specially made doors and fitting."